Index Map Shewing the Routes followed by The Members of the Yukon Expedition 1887 - 1888. 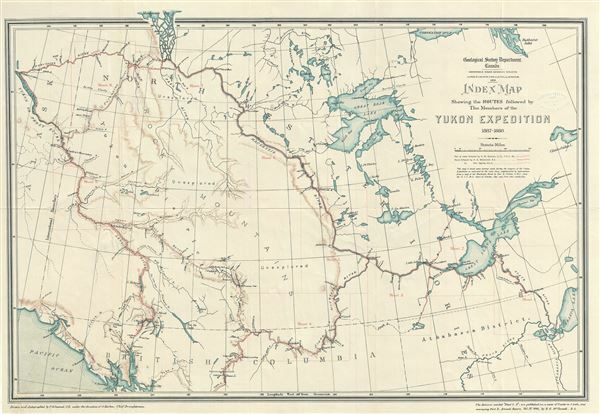 This is a scarce 1891 map of the Yukon Expedition in 1887 - 1888 issued by the Geological Survey Department of Canada. It covers from the ruins of Fort Yukon east to Athabasca Lake and from Mackenzie Bay south to Juneau City. The map identifies several important lakes, rivers, forts, lakes, bays and elevation. Several regions along the Rocky Mountains are marked Ã¢Â€Â˜unexploredÃ¢Â€Â™. This map predates the Yukon or Klondike Gold Rush by over six years. It follows the routes of Canadian surveyor George Mercer Dawson and William Ogilvie in the region, which at the time was part of the Northwest Territories and not yet a separate Yukon Territory. DawsonÃ¢Â€Â™s expedition led to some of the first maps of the region, and would later be republished following the Klondike Gold Rush. Dawson City, the center of the Gold Rush, was named after him. Ogilvie, who surveyed the Yukon and Porcupine Rivers would later go on to establish the location of the Yukon-Alaska boundary. The map was drawn by C. O. Senecal, C.E., under the direction of S. Barlow, Chief Draughtsman and published by the Geological Survey Department of Canada. Very good. Minor wear along original fold lines. Minor creasing and spotting. Professionally flattened and backed with archival tissue.